As we wait for more summits this week, let take a look at one of the most talked about stories from Everest 2017 is the fate of the Hillary Step. First reported as “gone” now Nepal officials are saying it’s just fine, just covered with snow. For those outside the climbing community, and for many inside, this seems like a silly discussion as we all know mountains move, change, grow and collapse all the time. So what if the Hillary Step changed? Nobukazu Kuriki has left Camp 2 to ascend to the West Ridge then the Horbein Couloir and on to the summit. Kilian Jornet may give his speed run another try. He already set a record with a 26-hour push from Base Camp to the summit and Madison Mountaineering puts 6 members, 3 Guides, 13 Sherpas on the summit morning of 23 May. First, lets look at some basic information. 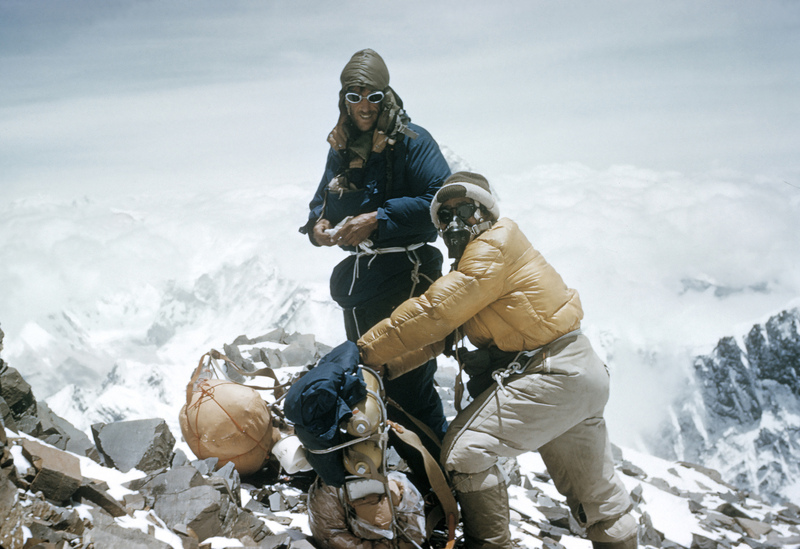 The Hillary Step was named after Sir Edmund Hillary who came upon it with Tenzing Norgay Sherpa in 1953 as they approached the summit. It is located between the South Summit (28,500′) and the true summit (29,035′). Scraping at the snow with his ax, Hillary chimneyed between the rock pillar and an adjacent ridge of ice to surmount this daunting obstacle, later to be known as the Hillary Step. The devastating 7.8 magnitude earthquake in 2015 was 100 miles away from Everest yet shook the ground severely. I was in the Western Cwm the day for the earthquake and can personally attest to moving ground and massive avalanches off Nuptse, Lhotse and the West Shoulder of Everest. 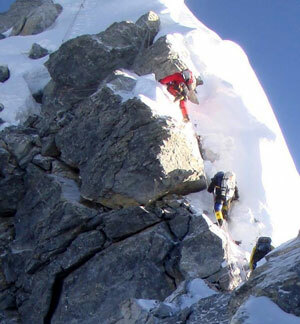 It is obviously plausible that large unstable boulder like the ones that define the Hillary Step could have moved. The recent case study for this was in New Zealand where the highest peak, Mount Cook lost 93 feet off the summit in 1991 due to a rock avalanche. News broke early in the 2016 season by climber, David Liano that the Hillary Step was gone. He took pictures, posted on his blog and the second guessing began. The two arguments came down to 1) it is covered with snow and is still there and 2) the 2015 earthquake caused the massive boulders that defined the crack toppled in the quake. Given it was covered in snow, no one could make a definitive conclusion however many tried. If you want to explore this further a good start is with Mark Horrell‘s investigative report on his blog from last year. 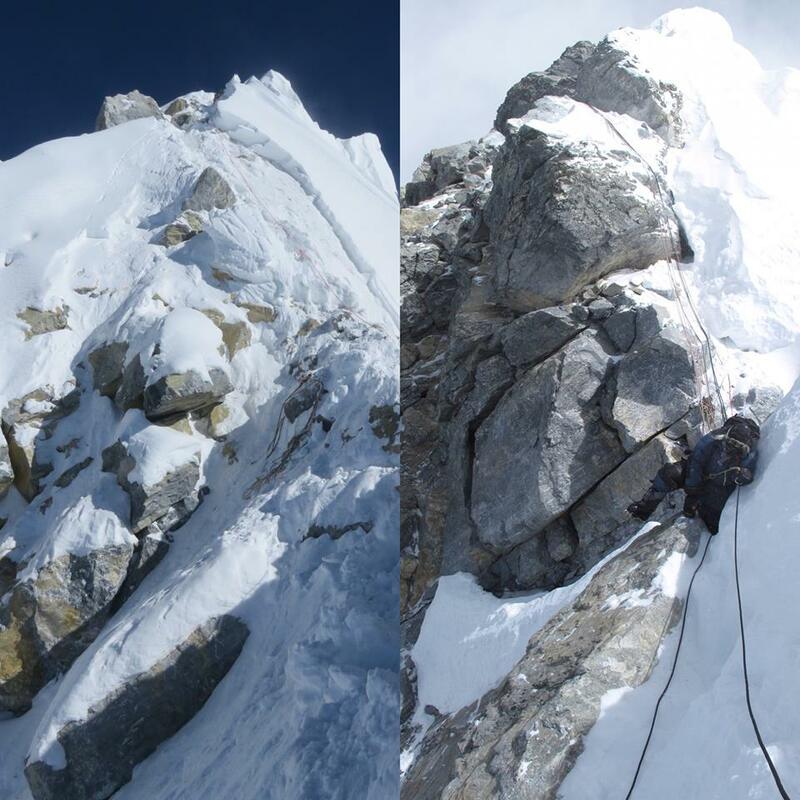 A few days after these summits, David Liano set the Everest climbing community abuzz with a Facebook post suggesting the 2015 earthquake had moved the rocks on the Hillary Step and it was now a snow slope. 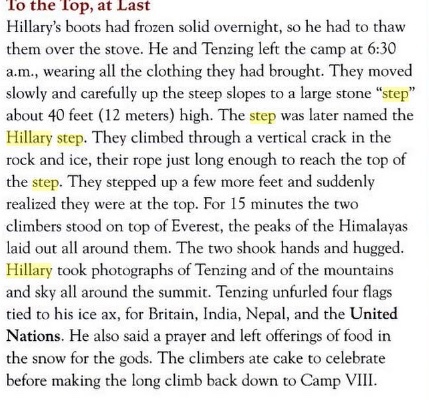 I consulted with multiple operators and Sherpas who have collectively over 100 Everest summits and had been on the Hillary Step after David. They felt the rocks had not collapsed and it appeared dramatically different due to an unusual amount of snow. Later in conversations with 2016 summiteers, they said the Step was a simple snow slope that looked nothing like the pictures for previous years. It may be next year if the snow blows away that the real shape of the Step will be known. The route from the South summit is reasonably technical and, shock horror, there’s no Hillary Step. The next thing you know we’re on the summit enjoying the views and the sense of achievement. 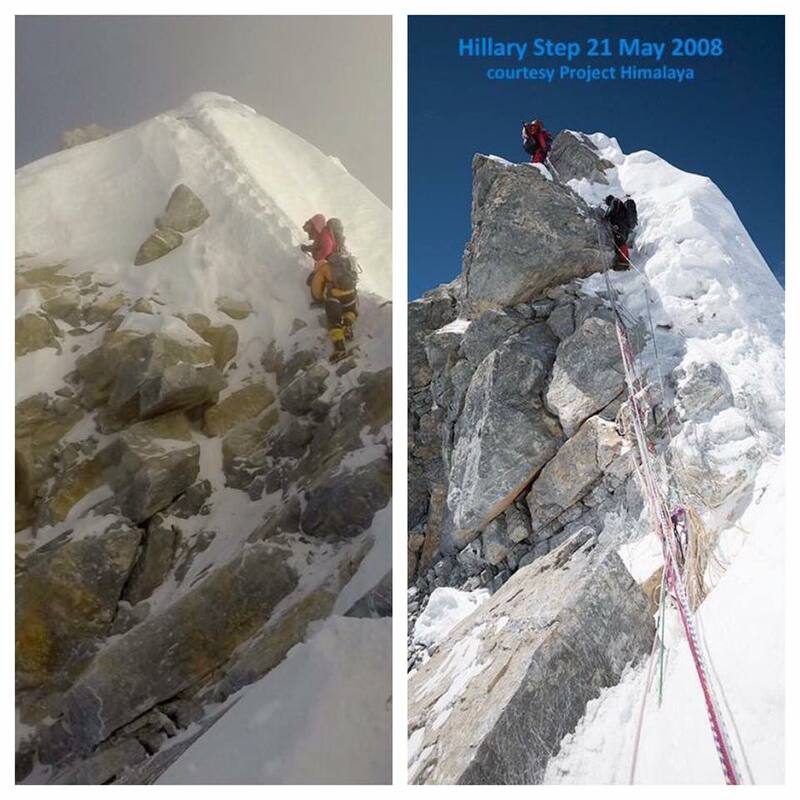 It’s official – The Hillary Step is no more. Not sure what’s going to happen when the snow ridge doesn’t form because there’s some huge blocks randomly perched hither and thither which will be quite tricky to negotiate. And that is why I love this sport! It does appear to be a long snow slope, and to my eye it looks like the large boulder to the climber’s left on ascending has “moved”. Now, is this simple a optical illusion, or has the snow covered so much that we really can’t tell? Perhaps, but the before and after photos are fairly clear. And with that, let the games begin!